During the past decade, permanent radioactive source implantation of the prostate has become the standard of care for selected prostate cancer patients, and the techniques for implantation have evolved in many different forms. Although most implants use 125I or 103Pd sources, clinical use of 131Cs sources has also recently been introduced. These sources produce different dose distributions and irradiate the tumors at different dose rates. Ultrasound was used originally to guide the planning and implantation of sources in the tumor. More recently, CT and/or MR are used routinely in many clinics for dose evaluation and planning. Several investigators reported that the tumor volumes and target volumes delineated from ultrasound, CT, and MR can vary substantially because of the inherent differences in these imaging modalities. It has also been reported that these volumes depend critically on the time of imaging after the implant. Many clinics, in particular those using intraoperative implantation, perform imaging only on the day of the implant. Because the effects of edema caused by surgical trauma can vary from one patient to another and resolve at different rates, the timing of imaging for dosimetry evaluation can have a profound effect on the dose reported (to have been delivered), i.e., for the same implant (same dose delivered), CT at different timing can yield different doses reported. Also, many different loading patterns and margins around the tumor volumes have been used, and these may lead to variations in the dose delivered. In this report, the current literature on these issues is reviewed, and the impact of these issues on the radiobiological response is estimated. The radiobiological models for the biological equivalent dose (BED) are reviewed. Starting with the BED model for acute single doses, the models for fractionated doses, continuous low-dose- rate irradiation, and both homogeneous and inhomogeneous dose distributions, as well as tumor cure probability models, are reviewed. 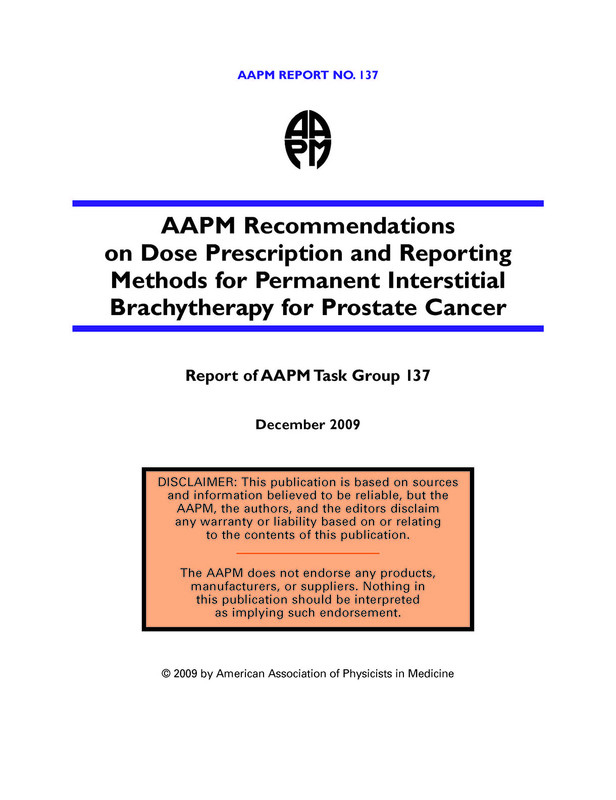 Based on these developments in literature, the AAPM recommends guidelines for dose prescription from a physics perspective for routine patient treat- ment, clinical trials, and for treatment planning software developers. The authors continue to follow the current recommendations on using D90 and V100 as the primary quantities, with more specific guidelines on the use of the imaging modalities and the timing of the imaging. The AAPM recommends that the postimplant evaluation should be performed at the optimum time for specific radionuclides. In addition, they encourage the use of a radiobiological model with a specific set of parameters to facilitate relative comparisons of treatment plans reported by different institutions using different loading patterns or radionuclides. An executive summary of this report was published in Medical Physics Journal (see below).